Sometimes life is weird, sometimes weirder than weird, and sometimes weirdness needs a category all its own. On the other hand, it’s hard to see how the story of Hiro Protagonist and his many exploits are going to be successfully made into a movie. At least it will bring Stephenson more readers if it’s made. I’ve got two readings happening in February, on Feb 5 at KGB Bar and on Valentine’s Day, Feb. 14, at Pen Parentis. Both are in New York. Save the date. Name a standup comedian that hasn’t been on a sitcom, The Daily Show, or Saturday Night Live. Name one who has appeared on, say, Letterman, Late Night, etc., whom you hadn’t heard of before but made you laugh. Tough, isn’t it? There are lots of men and women out there who will make you hurt yourself laughing, but not unless you go out and see them — how many great shows are you missing? What should you be reading this season? Hear from Sarah McNally of McNally Jackson Books about the runaway hits, the beloved secrets, and the must-reads of the 2011 fall season. Then wander the halls of Westbeth to attend live readings in the homes of Westbeth residents by some of the most exciting authors writing today. Don’t miss this rare opportunity to explore the oldest and largest artist community located in the heart of bohemian West Village, repurposed by renowned architect Richard Meier into 383 living and working lofts. The evening ends with a reception and cocktails. Tickets: $10. Purchase at ovationtix.com or at the door. Really looking forward to this unique event. I love this idea. Like a wine tasting for books. Intimate readings. I almost wish I were just going to the readings. And it features an excerpt of THE FINAL APPEARANCE OF AMERICA’S FAVORITE GIRL NEXT DOOR. REad it, love it, share it with everyone you know and at least three or four people you don’t. I don't know about brilliant so much, but I'll take it. Scan at the highest possible setting — I did it at 600 dpi. Really, less than that should be fine. I just wanted to give the OCR function in Acrobat Pro as much information as possible. Export to Word or RTF after scanning and recognizing text. Then, whenever you find a nit, such as 1 for I, do a global search and replace but make sure that you look at each one to make sure that it’s what you want to change. Your 1 could be part of that /1 for A ugliness. Run Word’s grammar checker, it will help find stuff. Quotation marks will be screwed up. Guaranteed. Check each one. Search on ” and ‘ and then make sure they’re correct. I had some that were truly weird. Especially with sentences beginning with “I. And then, go through and make sure that your close-quotes are all correct. Then, if you have a lot of formatting, like I did, with italics, etc., make sure the italics are italics and that stuff that’s supposed to be plain text instead of itals is actually pt. Do not expect this to be a quick job. It took me weeks, but then I only have a couple hours a day to work on this kind of stuff. 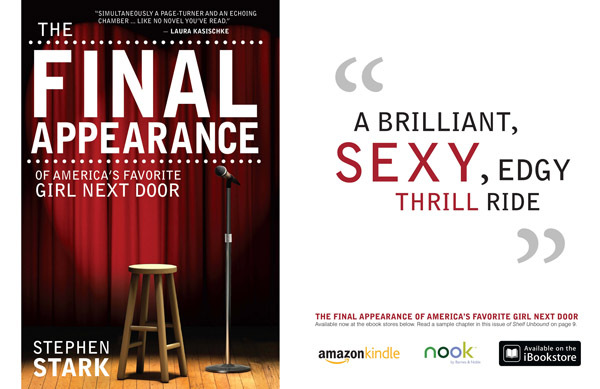 The Final Appearance of America’s Favorite Girl Next Door is out on Amazon. Warm up those credit cards and get one for everyone you know. It’s only available as an ebook. And if you’re not packing Kindle heat, but do have an ereader, it will be available elsewhere soon. Keep checking back here. Or treat yourself and get a Kindle today. Or tomorrow. Whichever is more convenient. It’s a beautiful idea. You can read it and hear him read it on The Poetry Foundation’s web site. It’s a strange thing to read your own novel when it’s about to get kicked out the door. And so it was this last week or so, finishing yesterday, with my ‘final’ reading of THE FINAL APPEARANCE OF AMERICA’S FAVORITE GIRL NEXT DOOR. Found a lot of little nits, so you with the ARCs, lots of little things are changed, so you have yourselves a nice little collector’s item. If you want one, an ARC, contact margaret@shelfmediagroup.com and she may be kind enough to send one to you. But back to ‘strange’: Spend 10+ years writing a novel and there are bound to be things you would change. But there’s a certain authenticity to the moment that seems necessary. Currently, the official publication date is December 1. But you may be able to get it earlier. I will update.